RANGOON — The European Union said on Wednesday that Burma needed “space” to deal with human rights abuses in its restive northwest, adding it would respect the call by country leader Aung San Suu Kyi to avoid the term “Rohingya” to describe persecuted Muslims there. The statement exposes a rift in the West’s approach to the sensitive issue, standing in contrast with the United States, which said it would continue to use the term, citing respect for the right of communities to choose what they should be called. Members of the group of 1.1 million, who identify as Rohingya, are seen by many Burmese Buddhists as illegal immigrants from Bangladesh. The term is divisive. Tensions around the Muslim minority are rising. This week, Suu Kyi told the United Nations Human Rights investigator visiting the country that the government would not use the term because it was inflammatory. Some 120,000 Rohingya remain displaced in squalid camps since fighting erupted in Arakan State between Buddhists and Muslims in 2012. Thousands have fled persecution and poverty. The U.N. said on Monday that the abuses, which include executions and torture, together may amount to crimes against humanity. “We understand that the term ‘Rohingya’ is emotionally charged in [Burma] and we have heard the call of the government to avoid creating tension by using polarizing terminology,” Roland Kobia, the EU ambassador to Burma, told reporters. “So we ought to give political space to initiatives to gradually find a solution to this protracted issue,” he said. Suu Kyi’s administration last week tabled a new term for the Rohingya—“Muslim community in [Arakan] State”—but the description has quickly run into opposition. The Arakan National Party (ANP), formed by hardline Arakanese Buddhists who enjoy a considerable following in the state, said the government was biased and rejected the new term. 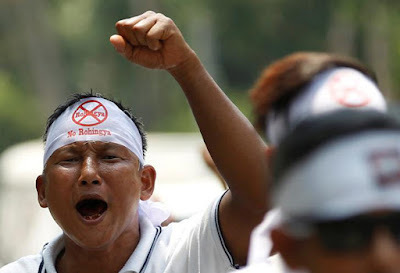 “We consider that using the new term […] is tantamount to meaning that they are natives of [Arakan State] by ignoring the original place of these Bengali people,” the party said in a statement. The previous military-linked government referred to the group as “Bengalis,” implying they were illegal immigrants from Bangladesh, though many have lived in Burma for generations. “The government should address the targeted persecution and discrimination against minorities and ensure protection of their rights by respecting their ethnicity, identity and name,” she said. Yanghee Lee, the U.N. Special Rapporteur on Human Rights in Burma, is touring the country on her first visit since Suu Kyi took power. Last year, he called her a “whore” after Lee criticized laws seen as discriminating against non-Buddhists and women. Suu Kyi, who starts her visit to Thailand on Thursday, has formed a committee to “bring peace and development” to the state in May, but its plans are not clear.